No one knows exactly what 2017 has in store, but one thing we can probably count on is the increasing presence of virtual reality–no longer as this thing that’s out there that we all know is coming, but rather as a medium that has started to arrive. In advance of what many are convinced is an impending gold rush, content producers have kicked up production. Los Angeles in particular is a hotbed of activity. 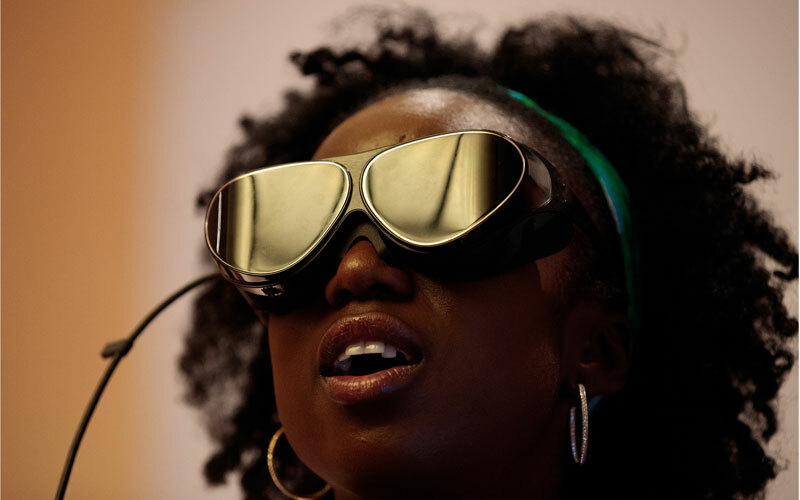 Whether it’s used for immersive, cinematic storytelling, hands-on applications in medicine, or 360 gaming experiences, the potential of virtual reality as a medium becomes clearer the more you study the companies at the forefront. Spearheaded by Chris Milk, Within has produced some of the most profound journalistic virtual reality experiences to date. In November its partnership with the New York Times yielded Displaced, a sobering and gripping 360-degree immersion into the lives of refugees from South Sudan, Syria, and Ukraine. The viewer meets three individuals who have endured war and displacement. The difference between how you perceive watching news about war-torn Syria and looking into the eyes of someone who is still experiencing it is startling. Displaced, like much of Within’s work, strives to elucidate how much more deeply you can relate to a real person or experience when you feel that you are there in a moment. Venice-based Specular Theory’s finest work is its Perspective series, a challenging two-part VR experience that shows you what it’s like to be in someone else’s shoes—quite literally and starkly. In part one, you see a scenario unfold alternately through the eyes of an intoxicated woman at a college party and two men who take advantage of her. In the second, a police shooting of a black youth shows how much one’s perspective can affect their reality. It’s controversial work and often difficult to watch, but after experiencing either of the Perspective editions, you may think differently about subjectivity. Both Perspectives premiered at Sundance Film Festival, and the latter was screened at Tribeca in New York. Downtown-based DAQRI invented the Smart Helmet, a worksite-ready helmet replete with a transparent screen built into the visor that connects workers to info about the project and also connects them to support channels. Its potential to impact worksite productivity and logistical operations is immense. Technically, the Smart Helmet is an example of augmented reality—created media overlaid upon reality itself—rather than an entirely created virtual experience, However, it is a shining early example of virtual’s potential outside of entertainment. DAQRI’s Smart Helmet is just about to hit the workforce at $15,000 a pop for developer units. Its use for military, infrastructure, and even sports, are all intriguing. As a content production studio, Venice-based Wevr specializes in audacious, playful, and bombastic projects. For example: Gnomes and Goblins, an experience created by director Jon Favreau and co-produced and co-published with Reality One, in which you hang out with a green creature in a Middle Earth-styled forest kingdom. Wevr’s other releases include the excellent 360 music video for hip-hop duo Run the Jewels’ track “Crown,” guided meditation sessions with Deepak Chopra, and a whole bevy of trippy, interactive experiences in cartoon worlds and psychedelic situations. Even more ambitious than its content, though, is Wevr’s launch of Transport, a VR platform that aims to be “The YouTube of VR,” which encourages users to upload and share their own VR creations. With a $25 million round of funding, Transport should be well-placed if and when this generation of VR amateurs produce their own experiences. That they will is Wevr’s big gamble. If you’ve ever wanted to skydive but don’t want to deal with that whole jumping out of a plane thing, Airflow (made by North Hollywood outfit Mindride), here you go. At the VRLA Conference downtown recently, a line stretched around the Convention Center all weekend for Airflow, an experience that creates virtual stimulation for both mind and body. Strapped in and hanging in mid-air, you soar through the air like a bird. If you’ve ever enjoyed a ride at Universal Studios, you know that pairing real physical and spatial sensations with CGI visuals can make for intense experiences. In Airflow your body feels like you’re flying, and as far as your brain is concerned, you are. Applied VR takes virtual experiences into the clinical setting. Instead of using medication during an uncomfortable or stressful procedure, patients can put on a headset and distract themselves by experiencing the vast landscapes of Ireland’s countryside, the beaches of Portugal, guided meditation in a forest, or by shooting some animated bears in a retro-style video game. It’s a very simple application for virtual reality, but, to many, it presents a preferable option to taking pharmaceuticals. Mindshow offers budding auteurs the opportunity to create their own stories by choosing the setting, building set design, picking characters, recording dialogue, and mapping out movements (with their own bodies!) to create a “show.” Users can share their productions and even collaborate on making animated movie magic. Somewhere in here is the potential for a Machinima or Adult Swim show. The full release of Mindshow is still impending, but it will be free on HTC’s Vive platform. Mindshow may even open up the full democratization of moviemaking, something that’s never been achieved. Previous articleChef Dakota Weiss Tells Us Her 10 Favorite Dishes in L.A.